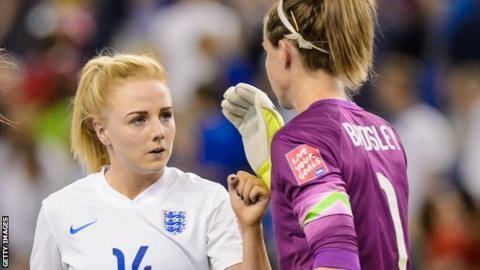 Defender Alex Greenwood says higher expectations of England have instilled a new "arrogance" in the national team after their bronze-medal success at the Women's World Cup earlier this year. Ahead of next week's opening Euro 2017 qualifier against Estonia, England boss Mark Sampson has said they will be looking to win the tournament. "There are new expectations now as we come on as a country," Greenwood said. "We are arrogant in a good way. We want to win everything that we play in." The 22-year-old Notts County player told BBC Sport: "I don't think it is pressure, it is the players coming through. "In the past we always settled for coming fifth or getting to the quarters. That is no longer an expectation for the young kids." Alex Greenwood scored twice against Reading, including a late winner in Sunday's Continental Cup quarter-final to send Notts County to the last four. She mistakenly wore the number nine training shirt in the warm-up and said it helped as she curled home an 88th-minute winner. Greenwood, then 21, was the youngest member of the England side that finished third at the World Cup, playing three games, including starting against Germany in the bronze-medal match. Four members of the England Under-19 side that won the Euros in 2009 were part of the senior side in Canada. Greenwood says Arsenal's 18-year-old midfielder Leah Williamson, who sealed England's place at this summers's Under-19 Euros with a retaken penalty five days after her initial spot-kick, is a leading example of the Lionesses' emerging generation. "Look around the WSL, there are kids that are 17 and 16 even, Leah Williamson is a perfect example - she will be a star of the future," Greenwood said. "If we can keep progressing players like that and bring them through, we are just a team waiting to win every tournament we are in." Sunderland's 20-year-old striker Beth Mead, who is the top-flight's leading scorer with 11 goals in her first season in Women's Super League One, joined the England squad at their training camp at St George's Park on Wednesday, but is yet to receive her first senior call-up. Before selecting his side to face Estonia, Sampson said Mead is capable of becoming one of the best in the world. "We have to look at the bigger picture," he added. "Beth has had a fantastic season but there's still a bit for her to do. We certainly see a huge amount of potential."